영국 에든버러 페스티벌에 무슨 일이? 3200여 명이 공부하고 있는 ‘실용영어 사관학교’ 영국문화원이 이번호부터 신동아 독자에게 영어 실력을 쌓을 수 있는 비법을 공개한다. 런던정경대 등 영국의 명문대 출신 전문 강사 50여 명이 영어로 읽고 쓰고 말하는 능력을 기를 수 있는 훌륭한 교재를 제공할 계획이다. 2008년 8월 영국 에든버러 프린지 페스티벌에 참가한 한국의 비보이댄스팀. 영어는 문화입니다. 영어를 구사하는 사람들의 문화를 이해하는 게 영어 실력 향상에 훌륭한 지름길이 됩니다. 따라서 습관과 풍습, 축제, 지역적 특성, 철학, 종교, 음악, 미술, 문학, 음식 등 삶의 주변을 면밀히 들여다보는 것이 중요합니다. ‘시사영어 따라잡기’의 첫 주제도 이처럼 문화 이해하기와 연결돼 있습니다. 본문 기사를 더 효과적으로 읽기 위해 우선 추론하기부터 연습해볼까요. It is common for people in their own language to use the sub-skill of reading for prediction to gauge the personal interest value of a text through headlines, sub-headings, photographs and illustrations, and so on. However, when it comes to reading in a foreign language, people often forget to do this, often thinking instead something like ‘if I read this, it′ll be good practice’. Predicting, though, motivates us to read, and therefore is an important sub-skill to practice. 1. 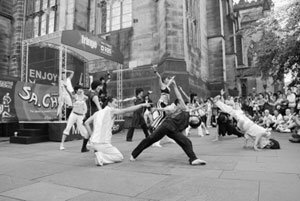 What′s the Edinburgh Festival? What time of year does it take place? 2. ‘Traditional’ and ‘contemporary’: but what? What would you expect to see at the Edinburgh Festival? 3. Looking at the photo, what kind of job do you think he does? Why do you think he′s such a ‘Busy man’? (1. 에든버러 페스티벌은 어떤 행사입니까? 1년 중 언제 이 페스티벌이 열릴까요? 2. 무엇이 전통적이고 또 무엇이 현대적이라는 걸까요? 에든버러 페스티벌에서 어떤 것을 볼 수 있을 거라고 생각하세요?